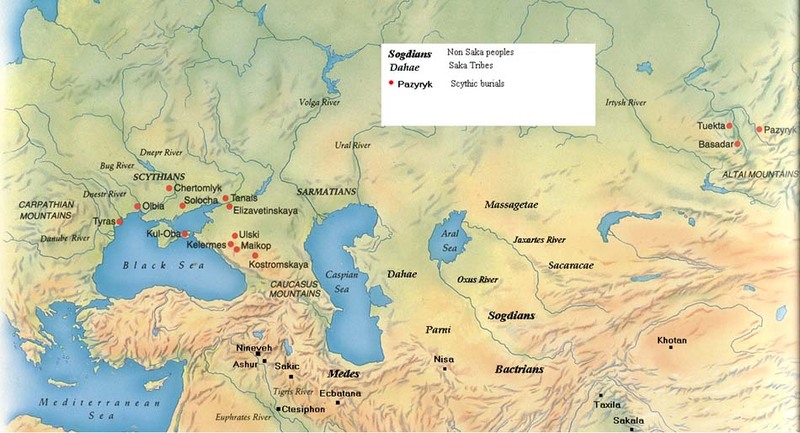 The commonality of Cimmerian and Sarmatian tamga is a little known, and even less advertized archeological fact that links Cimmerians and Sarmats and corroborates a relatively more "autochthonous" origin of the Cimmerians in comparison with their Scythian brethren, the Sarmat origin is attributed to the foothills of Urals extending to the Aral-Caspian steppes, while the Scythian kurgans march from the S.Siberia. 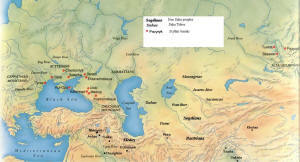 Plenty of bright, not so bright, and manifestly dumb minds worked to create an Indo-European or Iranian paradigms for the Scythians, Cimmerians, and Sarmats, but ignoring the contemporary witnesses and attempting to create their paradigm from scratch, with a limited knowledge at the time of creation, continually brings the atempts in conflict with the old and new facts of the scientific knowledge. Anyone interested enough in the subject would immediately note that the propaganda articles http://en.wikipedia.org/wiki/Cimmerians, http://en.wikipedia.org/wiki/Scythia, and http://en.wikipedia.org/wiki/Sarmatia are completely devoid of archeological, ethnological, and biological-genetical content. Cimmerian bronze arrowheads were noted for carrying a tamga resembling a "bird foot" (aka "chicken foot, chicken paw") . This distinction marks the Cimmerian bronze arrowheads in the monuments of the early Cimmerian Chernogorovsk Culture (900 - 750 BC) and in later Novocherkassk Culture (750 - 650 BC). In the following centuries, this tamga and its modifications , were noted on the two-sided arrowheads with arched tip dated to the 5th c. BC, and trilobed arrowheads attributed to the Sarmatian provenance and manufacture. Киммерийские стрел были отмечены за метку тамги напоминающую "птичью лапу" (также "куриная лапа") . Эта особенность отличает Киммерийские бронзовые наконечники в памятниках ранне-Киммерийской Черногоровской культуры (900 - 750 гг. до н.э.) и позже в Новочеркасской культуре (750 - 650 гг. до н.э.). В последующие века, эта тамга и ее модификации , были отмечены на двухлопастных наконечниках с арочной головкой 5-го в. до.н.э. и трёхлопастных наконечниках отнесенным к Сарматскму происхождению и производству.